• This paratrooper broke a rule that actually did exist. 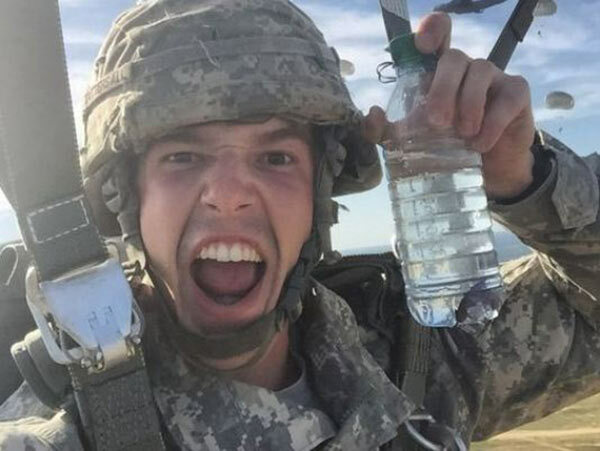 Apparently jumping with a water bottle inhabited by your pet Siamese fighting fish is frowned upon by the Army. Still worth it, if you ask me. Thank you for defending our country and fighting Adultitis, Mr. Tattersall. • Meanwhile, this guy got in trouble for building an epic cardboard fort in his yard. He was threatened with fines for violating building codes. I think code enforcer Gordon Sant should be cited for being an Adultitis-ridden jerk head. Left to their own devices, adults will ruin everything. • A while back, I drew a purple mustache on my son before we went out to lunch. I highly recommend it. Another good option: drawing eyebrows on them. To be actually trapped is to have no options, no choices, no possible outcomes other than the one you fear. Most of the time, when we think we’re trapped, we’re actually unhappy with the short-term consequences of making a choice. Make the choice, own the outcome and you can start in a new place. This is often frightening and painful, which is one reason it might be easier to pretend that we’re actually trapped.